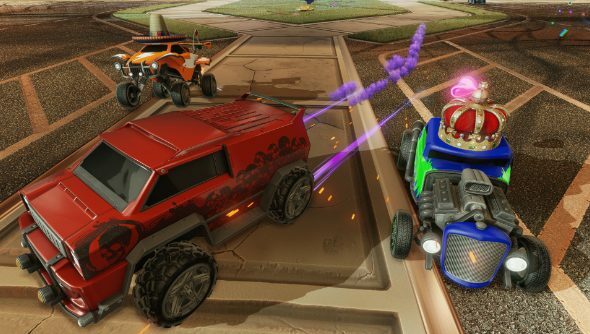 Psyonix are getting round to shaving the invisible edges off the bodywork of Rocket League’s cars in the next update. Here are thebest racing games on PCfor when you’re ready for a non-ball-based challenge. Eleven of the game’s cars are having their collision borders altered to more closely match the actual models they’re attached to in version 1.16 out this week. It’s not quite the massive basketball conversion update expected for sometime later this month, but it is a welcome bit of spring cleaning for a game that relies heavily on bumping into things. They’ve also managed to temper some of the rampant car-on-car violence in the sport and have been rewarded with an E for Everyone ESRB rating, down from the E10+ the game was originally awarded. So expect a fresh influx of actual toddlers in your matches, because that’s how video games work. Repairedcollision issues that resulted in incorrect ball-bounce behavior in some maps.